Neil Warnock expects to be in charge of Queens Park Rangers for two more games, BBC Radio London reports. The 66-year-old was placed in interim charge of the R's after Chris Ramsey was sacked on 4 November. He oversaw the 0-0 draw with Preston on 7 November and has brought in Kevin Blackwell to assist him at Loftus Road. Warnock, who was boss of QPR from March 2010 to January 2012, returned to the Championship club in an advisory role in October. QPR's next two matches are at Middlesbrough on Friday and home to Leeds next Saturday, suggesting an appointment before their trip to Reading on Thursday, 3 December. Former Leicester boss Nigel Pearson has been linked with a move to west London, while Burton Albion say they have not received an approach from the R's to speak to manager Jimmy Floyd Hasselbaink. 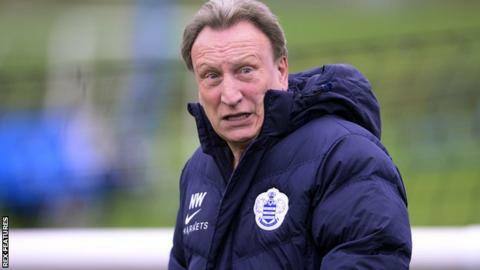 Under Warnock's leadership, QPR were promoted to the Premier League in 2011 as winners of the Championship, but he was sacked the following January with the club 17th in the top flight. He had been out of management since being dismissed by Crystal Palace in December 2014, after four months in charge. After joining QPR in an advisory capacity to Ramsey in October, Warnock said "full-time management doesn't interest me any more". Rangers are 13th in the Championship table, eight points off the play-off places.